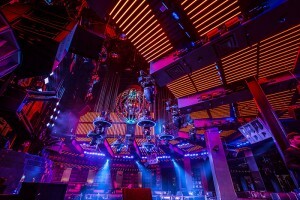 USA - Marquee Nightclub is consistently one of the highest grossing nightclubs in Las Vegas and one of the hottest and most luxurious nightclubs around. 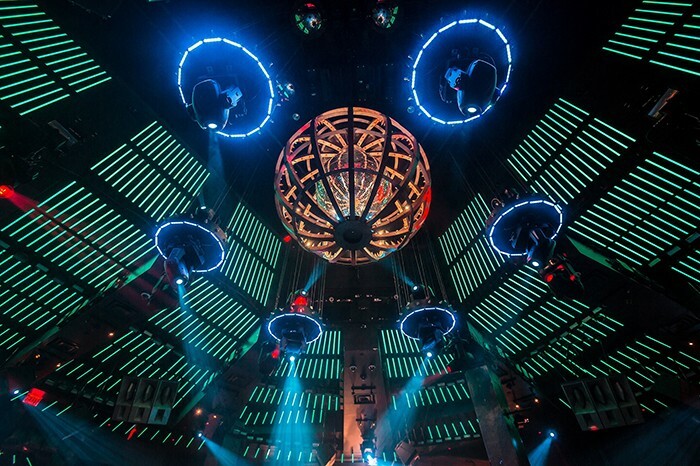 Located in the heart of the Strip, Marquee underwent a major LED lighting system upgrade recently with LD Steve Lieberman, owner of SJ Lighting, using over 1,100 new Elation Pixel Bar 40 LED strip lights to create an amazing 360-degree immersive experience. Marquee, located at The Cosmopolitan, is one of the most exclusive clubs you’ll find anywhere with high-end service, discreet VIP areas and exclusive lounges. Besides securing the best DJs from around the world, as well as other top name live entertainment, the club also hosts private events and parties. More than 60,000 square feet of space gives 3,500 guests plenty of space to mingle. The focal point of the club is the main room with dance floor and DJ stage and it is here that the club’s all-night energy originates. Steve found an opportunity to do something special by replacing a series of large white fabric sails that were getting tattered and discolored after four years of collecting dirt and dust. “They covered large parts of the ceiling and we opted to pull those down and put in something more digital, something that would accentuate the architectural space,” he said. Marquee is a good example of Lieberman's attention to detail and penchant for working with the architectural elements he is presented with, dressing and accentuating them to make them part of the environment and create the right atmosphere. Design-wise, laying out the system in a room that has a radial floor plan, trapezoidal-shaped dance floor, various levels, varying ceiling heights, multiple soffits and multi-sized coffers was, to say the least, a challenge. Despite the large number of fixtures used, the Pixel Bar system was easy to setup using RJ45 CAT5e ports and also easy to link together. Because the power supply and driver are enclosed in one it gave Steve the latitude to plug one box in and then daisy chain via Powercon, a simple wire schematic that made it easy for the electricians. It also allowed him to daisy chain Ethernet. Power and data control to the 1,100 Pixel Bar 40 units is regulated via 100 Pixel Net 4 drivers with Artnet protocol support. The Artnet input allows up to 4 DMX universes to be used as output to the bars and is Artnet data linkable via CAT5. The pixel mapping ceiling is controlled via a Madrix controller running 252 universes.